The problem with having two or more cloud drives is that it becomes too bothersome. You need to manage each account separately and this could take a lot of time. Well, there’s really no need for you to do so for as long as you use this free web application called DropInOne. 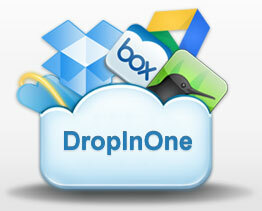 DropInOne is a free web application created by AOMEI Tech. It functions as a cloud storage manager that allows you to manage all of your cloud drives in just one account — upload, download, access, etc. 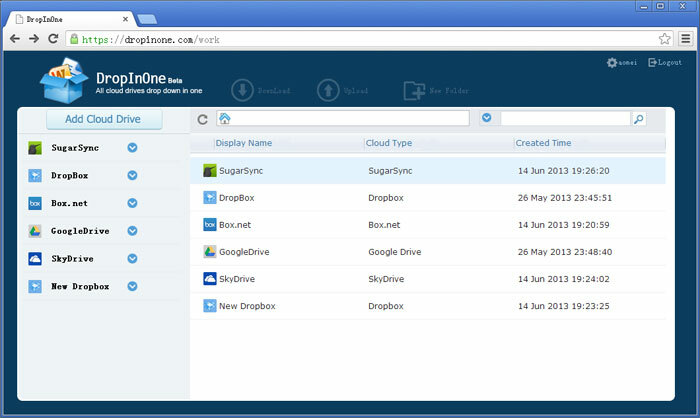 files across multiple cloud storage accounts. As of now, you can use this web app to manage your Box, Dropbox, Google Drive, SkyDrive, SugarSync and Amazon S3 cloud storage accounts. For a cloud storage manager, DropInOne is good and reliable but it isn’t really something that I would use. I find it lacking in many aspects plus it has a lot of issues. The first problem that I encountered while using this web app is that it didn’t allow me to connect my Dropbox accounts. I tried linking two of my Dropbox accounts but all of my attempts were rejected. This is an obvious bug in this web app, that should be corrected. After that, I decided to save some new files to my Google Drive account to check if the changes would automatically appear on the web app. I even decided to wait for a few minutes but nothing happened. It wasn’t until I pressed the “sync” button that the new files appeared on the web app’s user interface. Clearly there are still a lot of room for improvements and it would be great if they can provide a mobile app. 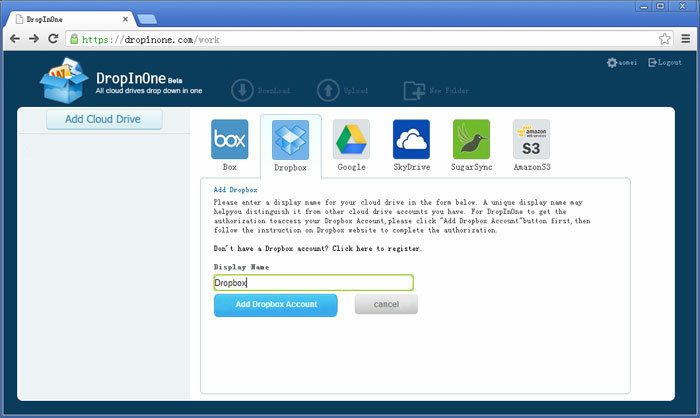 On the bright side, when it works DropInOne does what it is intended to do and that is to help you manage your multiple cloud drives in just one account. Besides, its user interface looks neat and you can easily view all of your connected accounts. It also provides an easier for option for file sharing and file transfer. All you need to do is to copy and paste the file or folder to your desired location and you’re done! I like the fact that this web app offers an easier way to manage multiple cloud storage drives but that is still not enough to convince me to use it. One of the main reasons why this app failed to meet my expectations was because it didn’t have the features that I wanted plus it didn’t allow me to connect my Dropbox. However, this is a new web app and hopefully the developer will fix the bugs in future updates. When (if) the bugs are fixed, I’m sure this will be a winner because it has a lot of awesome features… most notably the ability to transfer files from one cloud storage account to another without having to download it to your computer first.